Gold-Spur, Sharp-Ears. Photo by Cory Weaver. 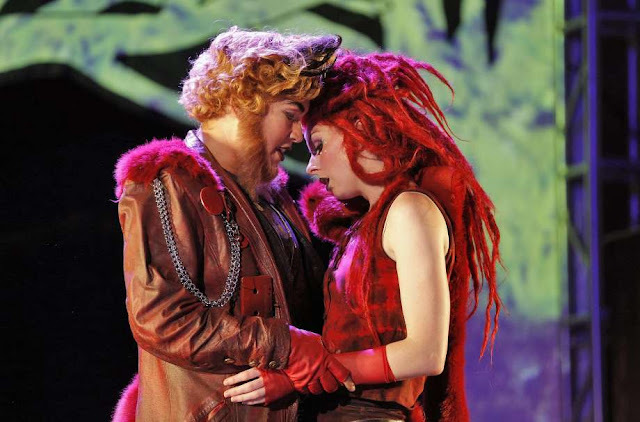 The story of The Cunning Little Vixen by Leoš Janáček, composed 1921-23, is from a serial that ran in a Czech newspaper. West Edge Opera presented it in the Oakland abandoned train station as a series of titled vignets. There are a number of anthropomorphized animals in this story, sometime recognized, sometimes not. My favorite recognition was seeing a group of women dressed in white and thinking "Chickens. Those are chickens." The chickens come with a rooster. The humans understand what he's there for, but the hens don't really seem to. Vixen escapes her captor after killing the rooster because he lords it over the hens. It was visually delightful, and musically fun. It is possible to stage this opera from either extreme of delightful children's story or tragedy, or anywhere in between. I think our production has certain adult features but is otherwise on the fairy tale side. Vixen dies and is replaced by one of her children. My favorite performers were Amy Foote as Sharp-Ears and Philip Skinner, a favorite at West Edge. The orchestra included what appeared to be an electronic marimba. This I've never seen before. West Edge has recently established a very high standard of performance, and they have met it here. Go if you can. It was interesting to me when the announcer explained that it took a long time for Massenet's Werther to become truly popular. Now it is the most frequently performed of Massenet's operas, passing Manon. I am not going to write a long review. This is the same production as the one I saw in Paris. The music was French enough, but the acting was a bit over the top. I love Vittorio, but I don't feel that I want Werther to be quite so mad. Maybe I truly love this opera only when it is Jonas. I want him to be unhappy but not mad. Christine Goerke wants to be sure that reviewers don't blame the actors for the acting. The director, Jacquot, must have approved it. Some will prefer it this way. Attention. The live stream of Die Meistersinger from the Bayerische Staatsoper in Munich scheduled for July 31 has been cancelled. There was planned to be a simultaneous festival in the plaza in front of the opera house, and that was earlier cancelled because of the recent massacre in an area of Munich that is close to the opera. It will be rescheduled. I have removed it from my calendar with great regret. Jessye Norman sings "Es gibt ein Reich" from Ariadne auf Naxos. One of the great things. Many dancers, supernumeraries and an invisible chorus. Les Indes galante, an opéra-ballet by Jean-Philippe Rameau, came to me by way of the Bayerische Staatsoper. From an historical perspective this is Rameau's most significant theatrical work, though I think it's only rarely produced. In music history he is most famous for his invention of the idea of the fundamental bass. [I'm not going to try to explain this. Complain in a comment.] Harmonically he is quite complex. 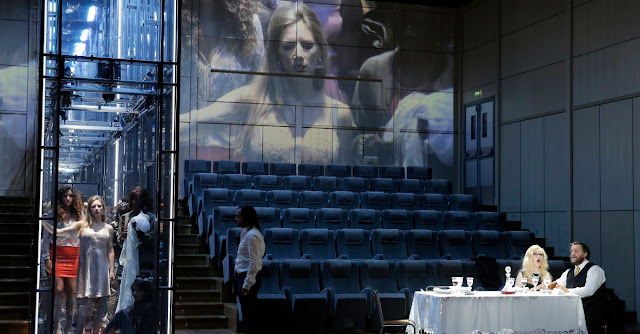 Opera production in the twenty-first century consists of two contrasting parts: historically meticulous musical production accompanied by clumsy, often unsuccessful, attempts to transfer the staging of the story into modern times. The musicology was impressive. The parts that show up most distinctly are the period sound of the orchestra and the beauty of the sung ornaments. The conductor describes this as a big Baroque orchestra: strings, bassoons, brass, theorbo, very busy harpsichord, etc. The singing is remarkable in how it does not sound like Handel. If I were to compare it to something, it would be bel canto. Light and beautiful. Lisette was especially lovely. We are in a timeless twentieth century, I believe, for our three love stories. It is all about tangled love affairs among the native populations. It's all very chaotic, as can be seen in the photo above. There is much modern dancing and what looked to me like break dancing. Don't trust me on this. The break dancer was the janitor. Cross dressing, both female to male and male to female, was a frequent feature here, and was from the original. This opera is from the French Baroque, so there were no castrati. We begin in a school with students. There are many small flags but only one large flag, the stars and stripes. So an American school? For our love stories we go to Turkey, Peru and North America. The Peru section includes a religious ceremony which has been translated into a catholic mass. The priest goes around on a Segue and gives people wafers that are drugged. They fall down. This is designed to scare the girl he wants. It's one of those operas that you just have to go along with. It was fun, but a little long. If I require the production to explain the opera, that has not happened here. The chaos seems to have been enhanced. It's still entertaining. Il Barbiere di Siviglia by Rossini has come to me by way of the Opera Platform. 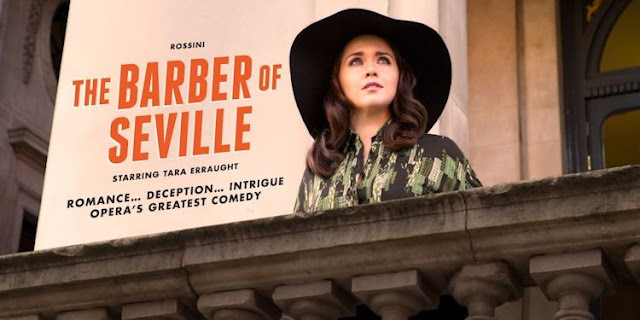 This is a new production from Dublin’s Wide Open Opera and stars the Irish singer Tara Erraught. I am a fan. I first saw her live at the Bayerische Staatsoper in Jenufa where she was a member of the company. I saw her in the stream of Der Rosenkavalier from Glyndebourne. Die schweigsame Frau from Munich was also viewed as a stream. None of these showed her in her primary Fach which is coloratura mezzo. At last we are there. I enjoyed this production. I kept puzzling over the dates. We are in the Seville of Francisco Franco who died in 1975. We have a VW bus and portable synthesizers, Roland and Suzuki. So sixties? Rosina's tutor is a record producer, it seems, and she is his star. At the start we see her being followed around by groupies. Perhaps Almaviva is one of her groupies. The set changes when stagehands come out and reverse the set pieces. Either we are outside with the poster of Franco, the balcony and the VW bus, or we are inside the recording studio with best selling records on the walls, equipment and synthesizers. This worked pretty well and was easy to follow. My only production related problem was during the opening of Rosina's big aria when loud clomping provided a background to Tara's singing. She is quite fine in this role, with excellent coloratura and big tone. She is unquestionably the star here and received the most applause. She convinced us that she could actually play a keyboard while Almaviva disguised as Lindoro did not. Don't get the wrong idea: I liked both Gavan Ring as Figaro and Tyler Nelson as Almaviva. I think the latter is harder to cast. This sprang up suddenly on Opera Platform, so catch it now. P.S. When I'm describing what goes on in a production, I am describing what I am seeing. If you read something completely different elsewhere, that may be because that person read what was supposed to be going on. I never read that stuff. I refuse to distinguish between what is going on and what is supposed to be going on. Between the ages of 13 and 38 I basically devoted my life to music. From this effort I achieved three college degrees, including the Doctor of Music with distinction from Indiana University. I never wanted to be a public school teacher, but worked for several years as an all subject substitute teacher. I remember jogging around the track at Mcateer High School in San Francisco shouting at the students that they should not let me outrun them. Adventures in substitute teaching. That day I was a PE substitute. I also remember a principal telling me I should be working 3rd street instead of substitute teaching. I had to ask around to find out what this meant. It meant I would be more suitable as a prostitute. I was a complete stranger to him. I wanted to make more money so I studied programming for 1 semester in a junior college and got a very prestigious job with the Bechtel Corporation. I enjoyed designing software, which involved interviewing people about what they wanted the software to do and drawing boxes. Part of the joy of working for Bechtel was that the office was in downtown San Francisco with wonderful scenery and countless restaurants. Working meant I could afford to eat at them. My software is still running and has had many thousands of users. When I started programming, the biggest shock was that everyone treated me with respect--this means sort of cowboy respect from the cowboy corporation, but I was from Oklahoma and knew what it meant. I obviously knew what I was doing and that was all that counted. Programming is a gift that you have received from your parents or you haven't. Perhaps music is, too. My father was an engineer. At the time I decided to retire something new came into existence: the blog. I saw this as an opportunity to use some of the information accumulated from all those years of studying music. The only problem I have is that I'm not tough. If someone decided to start attacking the things I write here, I would undoubtedly just stop writing them. My opinions do not come from heaven. They are just my opinions. If you have different ones, good for you. Just know this: I am perfectly well qualified to hold the musical opinions I hold. Are you? I am also fully qualified to give opinions about software without having to provide elaborate justifications. 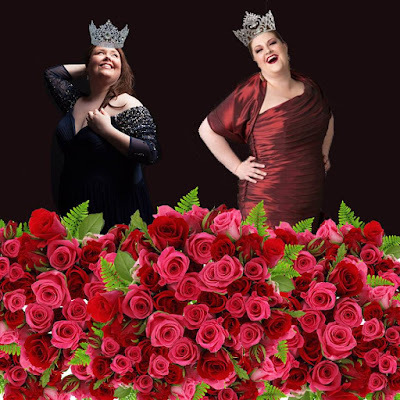 The web pages provided by many opera companies are atrocious. I want to thank all of you for your kindness. I don't have as much to say as I used to and may soon run out altogether. I have loved doing this. It has transformed the art form of opera for me. West Edge Opera has added a performance of Powder Her Face. Thursday August 11, 7:30PM - added! 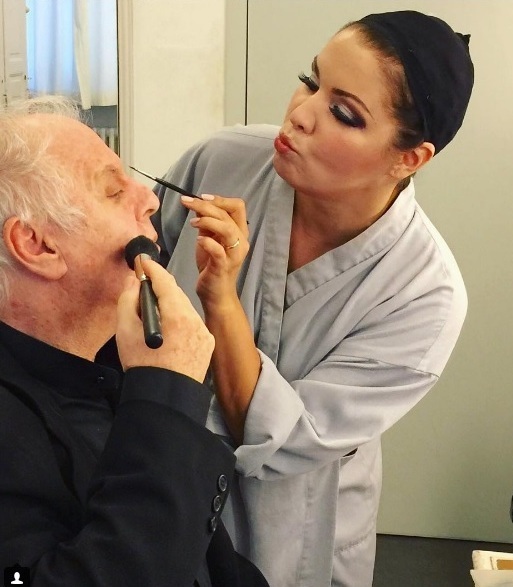 Yesterday Anna Netrebko took over the Instagram account of the Staatsoper Berlin. A versatile individual, she does Daniel Barenboim's makeup, and films on the stage during the performance. Here is the film she took while singing. I have photographs I took from the wings, but nothing like this. I'm speechless. Die Meistersinger streamed today from Glyndebourne. It was the same production we saw recently at the San Francisco Opera. This opera is all about Hans Sachs and Gerald Finley is his master. Hail. Research indicates that this is from 2011. I still liked it. 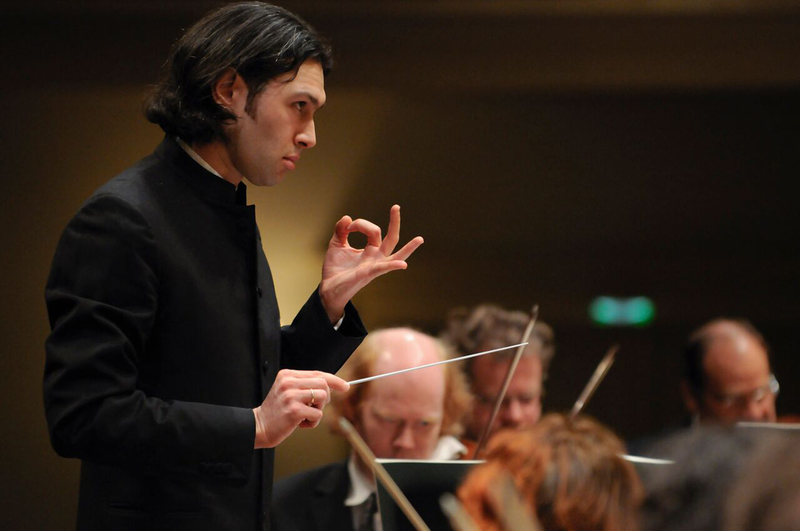 Vladimir Jurowski. How did I miss him? 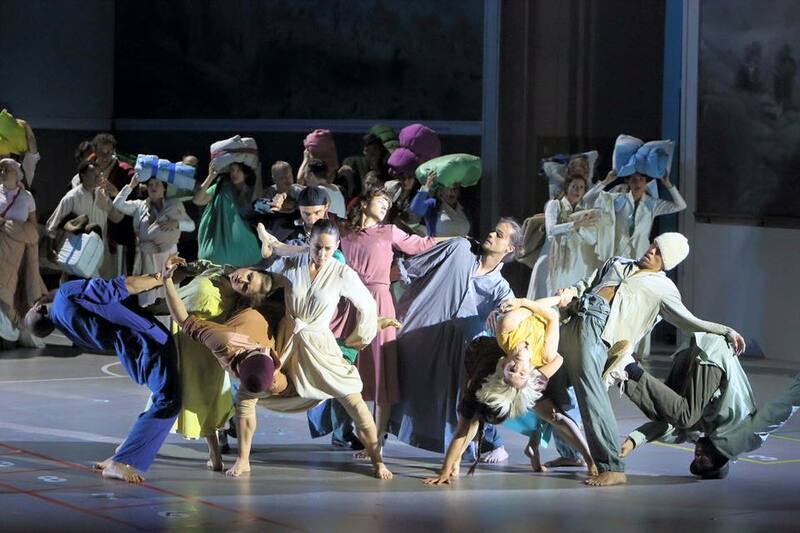 This production from the LA Opera of Puccini's Gianni Schicchi is by Woody Allen. Which must mean he goes to the opera. I like the wonderfully gangster look of Placido Domingo in his pinstripe suit. They take the body out and set it up like a beggar in the street. This comes with the joke of people dropping coins into the tin cup. The house has a view of the duomo and must be across the Arno and up the hill on the other side. Meredith Arwady is featured here. She has an amazingly boomy voice and is a terrific actress. Andriana Chuchman threatened to throw herself in the Arno in great style. [This means her "O mio babbino caro" was nice.] Those of us who have spent time in Florence love the many references to the city throughout this opera. Schicchi steals Buoso's house from his relatives by pretending to be him. Buoso has died and left everything to the church. So Schicchi gets the doctor to think Buoso is still alive and then dictates a new will to the notary leaving almost everything to himself. 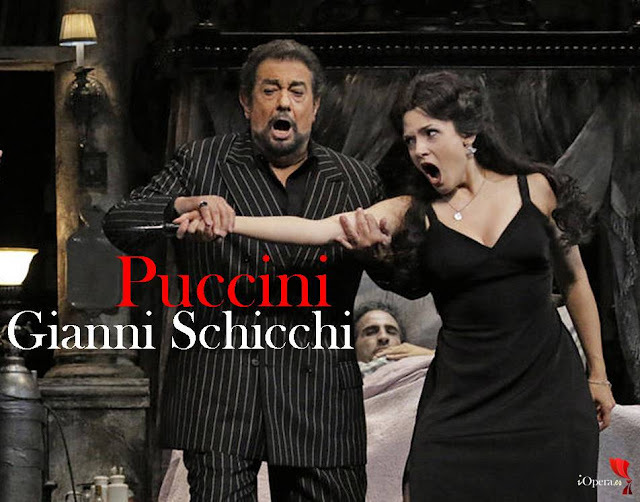 Then Schicchi throws everyone out of "his" house. Then Zita returns and stabs Schicchi. I'm too logical. Am I the only one who understands that for the house to belong to Schicchi, Buoso's body must reappear in the bed before the doctor returns after dinner. Then he will be declared dead and the new will read. 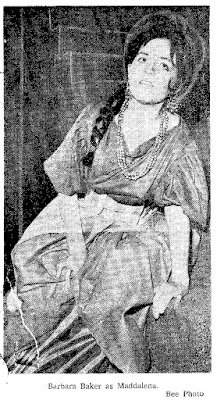 Killing Schicchi won't get Zita the house. Oh well. It's fun and you've missed it. Or try here. I have seen Handel's oratorio Il Trionfo del Tempo e del Disinganno staged before. This time I watched it on medici.tv from Aix-en-Provence. It is a youthful work written by 22 year old Handel while he was visiting in Rome. At that time in Rome opera was forbidden and of course women singing in public was also forbidden. All the high voices would have been sung by castrati. The previous time I saw this it was mounted in Zurich as a vehicle for Cecilia Bartoli as Piacere, and even Anna Bonitatibus who replaced her was incredible. It forms the core of Cecilia's album Opera Proibita. It's a hard work to stage since it is just a philosophical discussion and has no plot. The subtitles were in French. Watching a philosophical discussion in languages you only partially understand is a problem. Early on Disinganno says to Bellezza "La bellezza non ritorna piu." I repeated this out loud several times. (Beauty never returns.) For some people like Jennifer Lopez it never leaves, apparently. Just remember that at 75 no one looks that great. Sorry. If this work has a plot, it is putting Ballezza in her place. Eventually you'll look ugly just like us. Bellezza and her unnamed boyfriend attend a party where drugs are taken. They are seen passing the drugs around by kissing. Then suddenly first boyfriend and then Bellezza faint. Both are taken to the hospital where boyfriend is declared dead. He makes many more appearances, sometimes only in his underwear, without actually seeming alive. Bellezza both does and doesn't recover. Mostly her mascara runs, which is sort of ugly. She is teased by pleasure and lectured by time and disillusion. This staging worked pretty well but bogged down in the center. In Zurich amusing things went on behind the main singers, and that happens to a certain extent here. The biggest problem is that there is no Cecilia or even Anna Bonitatibus to keep us amused. Minkowsky is wilder and more exciting than Emmanuelle Haïm. Here's what I heard in Zurich.